The Pacific Science Center features some over-sized instruments. Here William plays the guitar. Elizabeth on the giant chair. The Pacific Science Center is a great way to spend a rainy afternoon. I feel terrible that in my last post I neglected to mention Susan & Larry and Gayle & Dennis with whom we also enjoyed terrific meals during the first Portland segment. We ate our way through the city. Upon our return to Portland for the second visit, we picked up awesome new eyeglasses – my first non-red glasses in about 30 years – and enjoyed a few more dinners with good friends. We’ve had a Lebanese mezza, Northwest salmon barbecue, sushi, more brew pub lunches, and breakfast at a very hip Portland spot, Tasty and Alder. Thanks to John & Janet, Diana and the fabulous Femmes, Jim & Wanda, and J.C. & Maarja! Notice we have not had Italian food at all (except the pizzas previously reviewed at Our Weekly Pizza). Our temporary home, an urban apartment on the Willamette River. The Steel Bridge is incredibly busy. Looking northeast from the apartment it was a little more serene. I love the public art in downtown Portland. So fun to wander the streets after 3 years away! Durango is high-altitude living. My brother’s house in the valley sits at 7500 feet/2286 meters above sea level. That takes some getting used to. That is higher than most of the hiking we do on the ridges and high meadows in the Dolomites. We needed to spend a couple of days getting used to the elevation in this high valley with little energetic exercise, so we took a ride on the Durango & Silverton Narrow Gauge Railroad. Thirty-one years ago Ric and I had our first vacation together and it was to Durango to ride the D&SNGRR. I am delighted to say the railroad has endured as fantastically as our relationship. The ride is a trip through time with authentic coaches, a coal-fired steam engine from the 1880s, and a narrator in character that relates stories of the era. It is an exceptionally beautiful ride through the mountains. I am pleased to say the Animas River is more-or-less of normal color after the toxic spill a few weeks ago, and is expected to recover. The D&SNGRR chugs along about 200 feet above the Animas River. My rail fan companion of 31 years enjoyed the trip. Amazing that this railroad was built in the 1880s. Maximum speed on the route about 15 mph. Once acclimated to the altitude, my brother and sister-in-law took us on a high-elevation hike to Engineer Mountain. For the record, we hiked to “Bus Stop” which is known in our family as “The Lunch Log.” Friends, this hike started at 10,660ft/3249m, and we climbed to 11,617ft/3541m. The round trip was about 5 miles, so not a bad climb, except for the fact that these flatlanders were hiking to an elevation higher than the peak of Mount Hood in Oregon (11,250ft/3429m). We feel pretty pleased with ourselves that we did it without fainting or hyperventilating. Engineer Mountain looms above the trail. Beautiful walk through piney woods. Mountain lake along the trail to the ridge below Engineer Mountain. Today we took a Path to Breakfast, enjoying a 4-mile jaunt through the valley and down into the city of Durango where we indulged in an American-style breakfast. 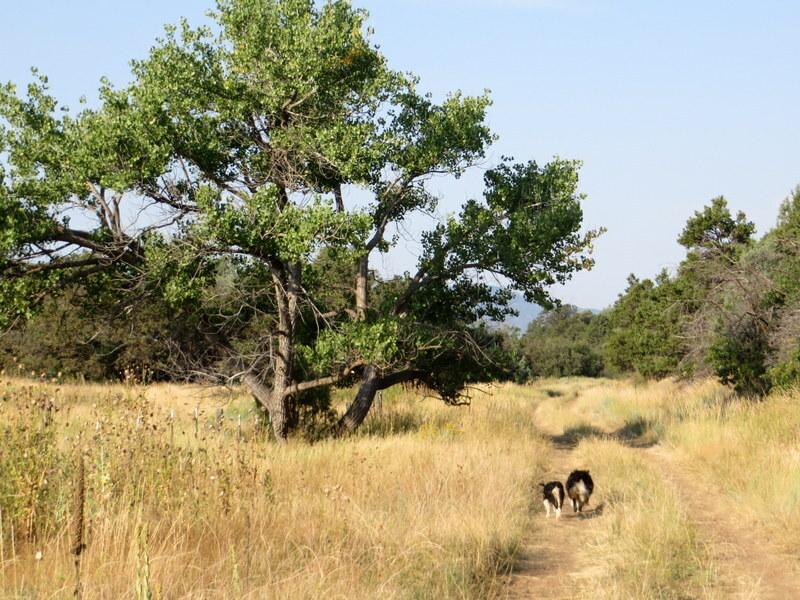 We were fortunate to have the company of Australian Shepherds, Quip and Millie, as well as humans Jane and Susan. We have not hiked with dogs in years and it added a lot of fun to the hike. Jane spotted bear tracks on the trail – a sizable bear with a paw as big as a small human foot – a reminder that this land is still wild. Even more fortunate, we were given a ride home from Durango. Milly and Quip on the path to breakfast, Durango. We have a few more days stateside. You’ll hear from me again, no doubt, as I get my head around the inevitable compare-and-contrast Italy and the U.S.
Sharon and Catherine photo bomb me. Love your post! Glad you enjoyed the railroad! Just got back from a month in Colorado. Beautiful state with great things to do, everywhere you look! Enjoy! Ciao Cara Terha! It is beautiful and great for outdoor sports! I miss the rainforest of the NW, though it is not much of a RAINforest this year. This is a wonderful post. I’m so happy that your time in Seattle and Portland was before now. The winds have brought the smoke over the Cascades from the horrific wildfires. Not a time to be out hiking around here at the moment. Hopefully, the smoke will clear out tomorrow. I can’t imagine what the people on the other side of the range are feeling. Carolyn, our timing for being in and leaving Portland could not have been better! We enjoyed our visit so very much and left with great memories to sustain us in the next two years. You look absolutely glorious in your photo! And the high altitude is so amazing as it brings a certain clarity to the skies, I think. We live at 1 mile high here in Reno and often hike at the 9-10 thousand feet level in the high Sierras. We love this high desert! I imagine you will be both happy and sad when you leave the U.S.A. and return to your current home. Wish we could have gotten together! Marcia you are too kind! We are feeling good, though, and extremely pleased we could handle some high-elevation hiking. We do have mixed feelings, but for now we feel Roma calling us “home,” as that is where we are settled and our darling cats await us. This trip has reinforced that we will return to Portland one day, although we will always miss the things in Italy that we cannot have in the U.S. I will write about that eventually…. I love high altitudes, but you are higher than most of the ones I’ve been able to hike in. How wonderful. And bear tracks. So cool that the high mountain west is still alive and well. Such a wonderful mega trip, Laurel. It was GREAT to see you and Ric. Carissima Gayle, It is hard to imagine that Colorado is so much higher than our beloved Dolomites! Happy to have survived without cardiac failure. Loved seeing you and Dennis, too!